At the age of 14, Dennis McCullough started working in the family tree business. At the age of 24, Dennis decided to open his own company. McCullough Tree Experts has over 40 years experience. During this time, we have earned the reputation as the area's leading experts in tree care and as a company known for exemplary service, quality workmanship, and long lasting client relationships. Owned and operated by Dennis McCullough, a Maryland State Licensed tree expert. (Lic. 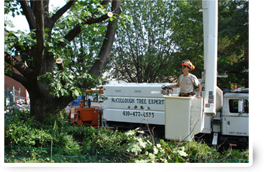 246) McCullough Tree Service has grown and evolved over the years to serve a growing number of commercial and residential customers in the Baltimore County and surrounding area. He is also certified by the National Commission for Certification of Crane Operators (NCCCO) for crane service. Our company is experience in providing service to apartment complexes, Mobile Home parks, HOA (Homeowners Associations), and commercial and residential building. 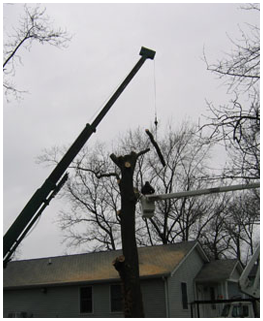 During a time when tree work becomes a problem, and your insurance company is involved , we have worked very closely over the years, with many insurance companies, to take care of the issue as quickly and efficiently as possible. McCullough Tree Experts will meet with you on-site giving you a complete inspection and evaluation to help you decide what tree service will best fit your needs. McCullough provides only exemplary service and professional workmanship while only doing what's really needed at an affordable cost. Removal of a tree is not always the solution, proper pruning and maintenance can preserve a tree for years.